If you’ve been on holiday to Spain or have eaten migas in a Spanish restaurant, the usual thing is that it leaves you all day thinking about how to get the original and authentic migas recipe. That’s because the taste and texture of migas is so exquisite, that it’s not easily forgotten. But, do you know how to make migas? 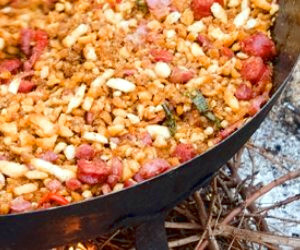 In Spain, there are many migas recipes with different peculiarities, depending on the region in which they’re made. But there’s one Spanish migas recipe that prevails over any other: the "shepherd’s migas" made with bread, peppers, garlic, chorizo, bacon, olive oil, etc. 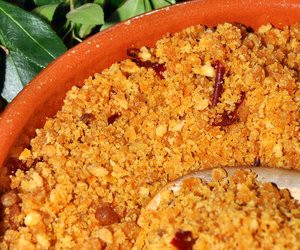 Crumbs in Spanish (breadcrumbs) is written as migas, a term that is also used in other countries to refer to foods that are based on the Spanish recipes. It’s the case of delicious Mexican migas made with corn tortillas and a mixture of eggs and vegetables. Or the Portuguese migas, which in some places are made with bread, and in others with potatoes. But in this article we’ll tell you everything about the authentic and original recipe for migas, as they are cooked in Spain. Pay attention, because you’re about to discover what’s possibly the best migas recipe you’ve ever tasted, and the best thing is that it’s incredibly easy! 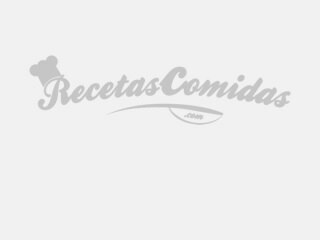 The authentic Spanish migas recipe, with chorizo, bacon, peppers, melon, etc. It’s a traditional Spanish breakfast, which is also served as a starter. Crumb the bread, pour into a bowl, add the water to it with a flat teaspoon of salt. Cover the migas with a cloth and put to one side. Cut the four cloves of garlic and the 2 red peppers into pieces, and make a sofrito (sauce) in the base of your migas casserole dish (must be wide and deep) with a good dose of olive oil and put to simmer. Once the garlic and peppers turn golden, add the bacon and chorizo, ​​also chopped, and raise the heat a little. When all is done, pour in the migas and paprika (one or two tablespoons, to taste), stir, salt to taste, and moisten with small amounts of water while you stir. Migas should be loose and not too soaked in liquid. For serving, put the migas in a cup that will serve as a mold, press, and turn them on the plate. On the top, put a piece of melon, and on top of it, a slice of Iberian ham. Delicious! Although Spaniards usually opt for a sweet breakfast of milk chocolate or coffee, toast, cookies or cereals, the fact is that migas are usually taken at breakfast, although now only rarely. In other words breakfast migas, therefore, is not extravagance in Spain, although migas are very versatile and can be used on any occasion: for meals, as an appetizer, as tapas (a snack with beer and wine), as dinner, etc. The presentation of the different recipes is also very diverse, as is the case with recipes for migas eggs. 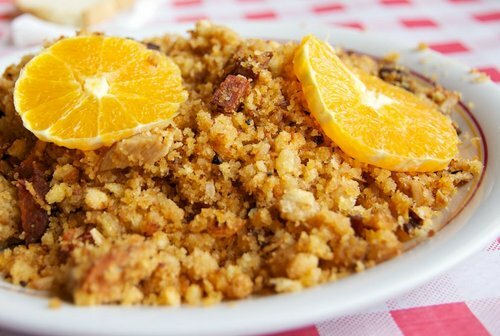 However, once the migas are made as shown in this migas recipe, it’s up to you to seek the taste and texture contrast by serving them with fruit pieces (melon, grapes, orange, etc.) or with fried sardines, with pieces of Iberian ham, etc. In the case of breakfast migas, it’s usual to accompany migas, served in small bowls, with coffee. Those who see it for the first time are often surprised, but it’s a tradition in Spain, just like a breakfast of churros, which is another classic spanish recipe. And it’s not that we have resorted in this case to an easy migas recipe because the reality is that Spanish migas are real easy to make. In fact, it’s a popular recipe of using ingredients you’d normally throw in the trash, such as stale bread, which is closely linked to the gastronomy of the humble classes. Nowadays, however, it’s easy to find migas food on the menus of the best restaurants. And you, how do you make migas?